Our Mini-Helmet is available with Red, Black, Blue or with Green lettering; view samples of colors on our Mini Football Helmets page. 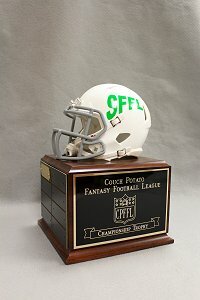 Our Mini-Helmet Trophy features your league initials! 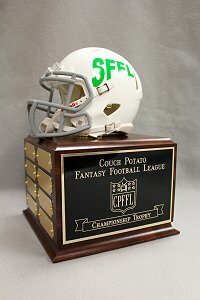 Helmet is white, and is an excellent small-scale replica of an actual helmet (size 3 5/8!) - complete with padding and chin strap! 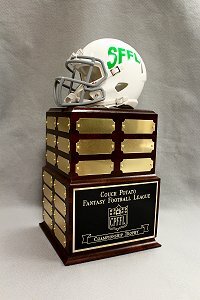 This award was designed to last 16 or 24 years, or more!